Brian Carter, has a well-earned a reputation as a master of blending. 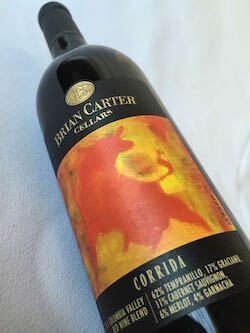 His 2012 Corrida (Spanish for bullfight) red blend of 62% Tempranillo, 17% Graciano, 11% Cabernet Sauvignon 6% Merlot and 4% Garnacha illustrates why and shows his skill with building a blend focused on the grapes of Spain. Using grapes from across Washington’s Columbia Valley, this blend offers aromas of oak spice and a fruit compote that ranges from red to blue to black. In the mouth, the fruit components are blended so seamlessly that it’s difficult to pick out the disparate elements. Instead, cherries, blackberries, blueberries, plums and currants join into a compote from which only blueberry and plum skin tannins emerge clearly. And despite such tannic ingredients as Tempranillo, Merlot and Cabernet Sauvignon, the finish shows Carter has tamed the tannins in this bullfight. This earned a double gold medal and best of class at the 2016 Cascadia Wine Competition.